An exciting day as over 100 sites were relaunched with WordPress as the software powering Startup Week. I’ve been using WordPress since 2004 and have so much love for it. The first Startup Weekend was built using it and it just has this feeling of magical community organizing. My job with Startup Week is to make sure you as Startup Week organizers have the very best experience and are given the tools to be as efficient as possible. This event helps develop and encourage your entire community and we can’t thank you enough for stepping up and organizing something big! If you are not an organizer head on over and apply here. So, we have new sites! How do we use them to help through amazing events? First thing is know that there are two states of your site: Pre Event and Live Event. Everything on the page can be customized by logging into wordpress. You should have an admin login from Andrew Hyde (check your email) or head to yourcity.startupweek.co/wp-admin and log in. If we are just setting up your site, a lot of this will be done for you but let’s talk about what each one does. City Name, State Name and Country Name help us map out the city. 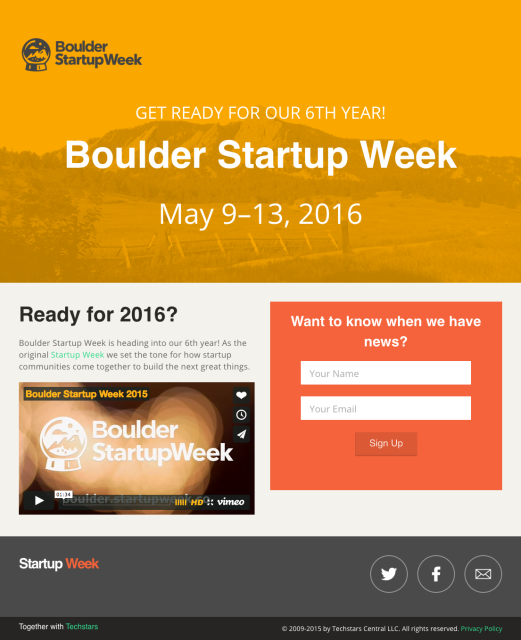 The Start Date and End Date must be filled out if you want your site to show up on startupweek.co! You can leave these blank until you know your final date. The Hero Image is an image you have the rights to use of the skyline of your city. We make this black and white and then about 20% transparency in photoshop or your favorite graphics editing platform. 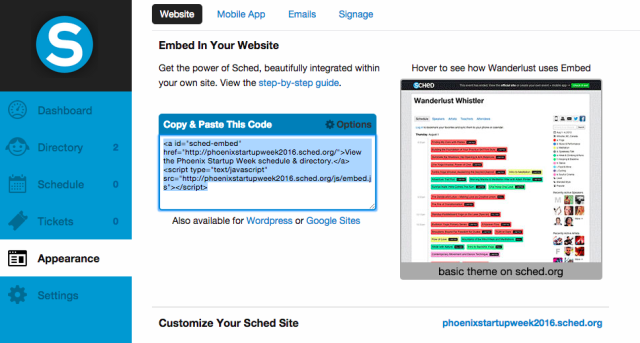 The Coming Soon Headline controls what is listed above your CityName Startup Week. The Signup Headline is the call to action to join the mailing list / launch email list. Rounding out the options are the Facebook, Twitter and Email link. If you would like to add content to the left of the signup form you must edit the “Home” Page under Left Sidebar -> Pages -> Home. On the City Settings page you need to update a few things for a live site to update. Change the “Registration Opens” to the day when you want your Sched schedule to be published on the site. 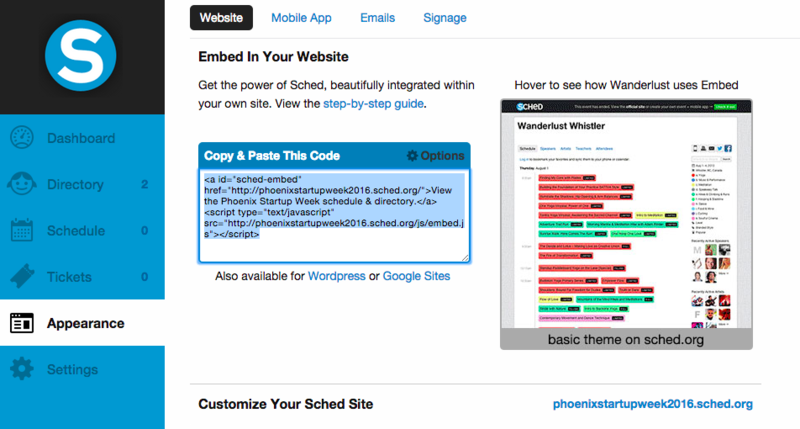 The Sched Embed code can be found on Sched -> Left Sidebar -> Appearance! You can have a blog by adding Posts or Pages for more static content. Email me at andrew.hyde@techstars.com if you need help or to request a feature! We are building this for you!